The KM Charity Team ran a ‘Walk on Wednesday Christmas Challenge Day’ for the most children in a class that used ‘Green Travel’ to get to school and we are so pleased to announce that out of the many Classes in Kent schools that took part Oak Class won. The KM Charity Team has organised an amazing prize for winning this. 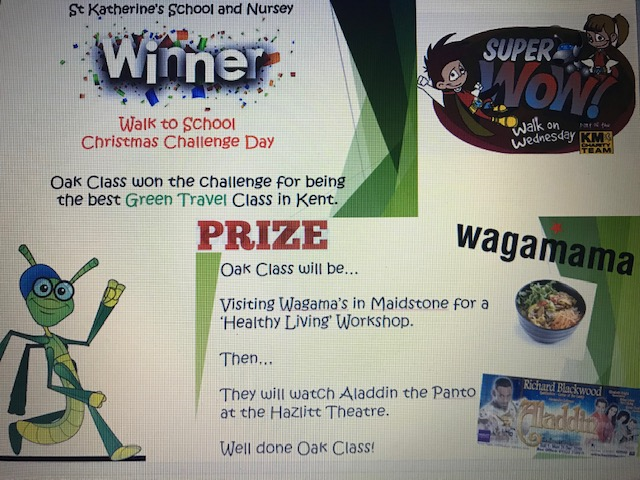 The prize is for Oak Class to visit Wagamama's in Maidstone for a Healthy Living Workshop and then they will be hopping next door to the Hazlitt Theatre to watch their panto – Aladdin. Congratulations and well done to all in Oak Class!